TEL AVIV, Israel & LEHI, Utah–(BUSINESS WIRE)–MyHeritage, the leading global service for family history and DNA testing, announced today that it is extending DNA Quest, its pro bono initiative to reunite adoptees with their birth families through at-home DNA testing. The first phase of DNA Quest was launched in March 2018 and offered 15,000 free DNA kits to adoptees and those seeking to reunite with family members who were placed for adoption. This resulted in many successful reunions. Due to the large number of applicants, a waiting list of several thousand people was established after registration closed in May 2018. The next phase of DNA Quest announced today re-opens applications on the project website (www.dnaquest.org) and will offer an additional 5,000 free DNA kits to eligible applicants from all countries. Preference is given to applicants who are unable to afford genetic testing. I need a bunch of years to read through all the microfilmed and manuscript records of the legendary Hudson’s Bay Company. I can view some at places I regularly research and need to go to Winnipeg to access the bulk of the records. Now we have some great news. Yes, it’s January and many of us are seeing snow and cold temperatures. Let’s plan for summer. Join your fellow genealogy enthusiasts for two weeks of quality and extensive education this summer. The Genealogical Research Institute of Pittsburgh is fun, too. There is a course that will fit your level of interest and experience. I am the coordinator of a July course and have three other excellent instructors, Melissa Johnson, CG, Karen Mauer Jones, CG, FGBS, and Debbie Mieszala, CG. The course is titled “Digging Deeper: Records, Tools, and Skills.” Ask yourself these questions and if you answer yes to any of them, this is the course for you. Have you moved beyond the beginning stages of researching your family history? Maybe you have researched online but know there must be more to be done elsewhere or that you have missed some online resources? Do you need a firmer foundation before taking advanced or specialized courses? Are you not yet comfortable with in-depth evaluation of documents and setting up research plans? For more about the course and the individual sessions, check here. Click here www.gripitt.org/ for full info on the location, courses, and instructors. BCG’s webinars are normally held on the third Tuesday of each month at 8 p.m. Eastern time. In order to accommodate those who might have schedule conflicts, most webinars can be accessed by the public at no charge for a week after each live broadcast. BCG webinars are always free to BCG-certified associates. ** Please note that Yvette Hoitink’s July 16 webinar will be broadcast at 2 p.m. Eastern time. In addition, the two webinars by Claire Bettag on September 17 and October 15 will not be recorded and will be available only via live stream. BCG receives a commission if you register by clicking our affiliate link: http://legacy.familytreewebinars.com/?aid=2619.To register for more than one webinar at the same time, use our affiliate link:http://legacy.familytreewebinars.com/?tid=3049. View BCG’s past Legacy webinars using our affiliate link at http://legacy.familytreewebinars.com/?aid=2619and https://bcgcertification.org/learning/skills/webinars/. Again, BCG receives a commission if you register by clicking and buying via our affiliate link. For more information on educational opportunities, please visit: https://bcgcertification.org/learning/education/. The words Certified Genealogist and the designation CG are registered certification marks, and the designation CGL and Certified Genealogical Lecturer are service marks of the Board for Certification of Genealogists®, used under license by board certificants after periodic evaluation. January 2019 starts a new travel year for me. The first trip is to Salt Lake City to do client research and teach 3 sessions in the Salt Lake Institute of Genealogy’s Native American course. 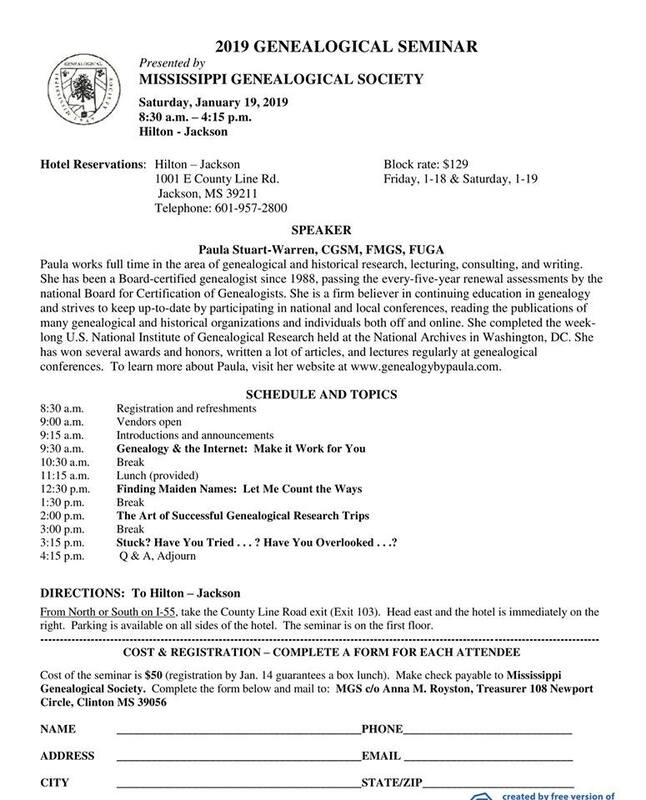 Then I am excited to be off to Jackson, Mississippi to do a day-long seminar on 19 January for the Mississippi Genealogical Society. The flyer for that event is below. In case you haven’t see this exciting news over the past few days! Legacy Family Tree Webinars has announced the addition of closed captioning to its services. This includes my November 2018 webinar, Railroad Records and Railroad History: Methods for Tracking. From their press release: “Implemented as a full human-curated transcription via synced subtitles, closed captioning is now available as an option for all live and members-only webinar recordings released since May 1,2018. In addition, the most popular 50 webinars on the platform and all MyHeritage-specific webinars have been captioned. Legacy will add captioning to all new webinars going forward. We are committed to providing the best genealogy and DNA education for all,including people who are hard of hearing,” said Geoff Rasmussen, founder and host of Legacy Family Tree Webinars. “Captioning is an excellent way to make online education more accessible, and is also a benefit to non-native English speakers who struggle with spoken English but have an easier time with written English. When we acquired Legacy last year, we promised to invest resources to improve the webinar platform and increase its reach, while maintaining its high quality and unique character”, said Gilad Japhet, founder and CEO of MyHeritage. “The addition of closed captioning makes good on this promise and, with translated captioning coming up soon, will help make the webinars accessible to millions of people in Europe and other countries, true to MyHeritage’s goal of making genealogy and DNA testing available to huge consumer audiences worldwide”. To access closed captioning, click on the blue CC icon in the lower right-hand side of the video you choose to view. 207 webinars are already captioned! Those from the MyHeritage live 2018 conference in Norway are already captioned. To access the closed captioning requires a subscription to the webinars. The low cost of $49.95 for one year of unlimited access to all the 800+ webinars.